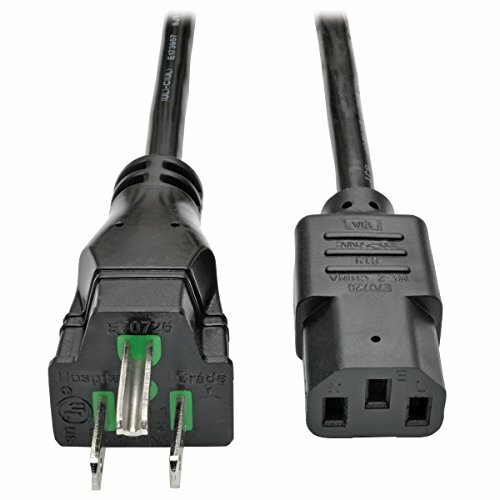 The P006-025-HG15 Hospital-Grade Computer Power Cord features a C13 plug on one end and a NEMA 5-15P-HG plug on the other, allowing you to connect your computer or peripheral to a hospital-grade AC power outlet. It's tested to ANSI/UL 62 and 817, as well as CAN/CSA C22.2 no. 21 and 49 standards, ensuring it's a safe, reliable power solution for hospital environments. The C13 plug connects to computers, printers, scanners, monitors and other electronic devices with a three-pin C14 port. This 25-foot 125V/15A cord features 14 AWG wire, a flexible SJT jacket and fully molded ends for optimum performance.